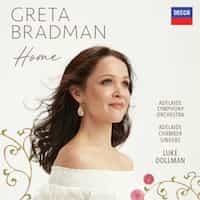 Embracing songs repeatedly requested by her legion of fans, Home is Adelaide-born Greta Bradman\'s tribute to her homeland, and will feature 20 songs and arias that best encapsulate the essence of family, friends, and returning to one\'s place of origin. Included on the album are favourite classical songs such as Dvorak\'s Songs my Mother Taught Me, Mendelssohn\'s O for the Wings of a Dove, and the Bach/Gounod Ave Maria. Traditional songs include Greensleeves, and Auld Lang Syne, while songs with underlying spirituality include Franck\'s Panis Angelicus, and Henry Bishop\'s Home, Sweet Home, the latter recorded with just harp. Also included on Home are orchestral arrangements of three songs especially for this album, by Richard Mills, composer, conductor and current Artistic Director of Victorian Opera. Working together with Greta, and using his fantastical sense of colour, Mills arranged and orchestrated the folk song Early One Morning, the seldom-heard Spiritual Let Us Break Bread Together, and Every Day Is A Rainbow Day For Me - a song originally scored for voice and piano, and written in 1930 by Greta\'s grandfather, Sir Donald Bradman. True to its \"homely\" intentions, Home was recorded with the Adelaide Symphony Orchestra, the Adelaide Chamber Singers, and conductor Luke Dollman, it the glorious acoustic of St. Peter\'s Cathedral.